Skunks are usually noticed more from smell than sight. The odor may linger for days where a skunk has sprayed. 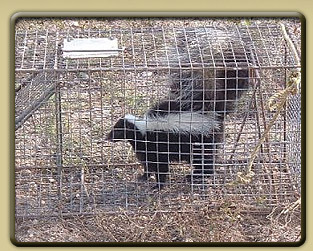 Persistent, faint musk smells associated with a 4-6 inch diameter hole under a building or woodpile indicates that a skunk may have taken up residence. If you discover a den that you suspect might belong to a skunk, it's time to call Cages by Jim. Skunks - Skunks are Mammals best known for their ability to secrete a liquid with a strong, foul-smelling odor. In February, breeding season begins, and lasts until the end of March. Males may stay with the female, but usually leave by April. In late April or early May, 61-69 days after mating, females deliver up to ten mouse-sized kits, but litters are usually five or six. Infants are born blind, deaf, and nearly naked, but the black and white color pattern shows. They weigh about 1 ounce. At 7 days of age, the infant skunks have doubled their weight to 2 ounces. At 2 weeks, infants are fully furred, and weigh about 41/2 ounces. At 17 to 21 days, the eyes and ears will open, and at the age of 1 month, kits weigh about 12 ounces and start walking. Rinse your pet thoroughly when finished.